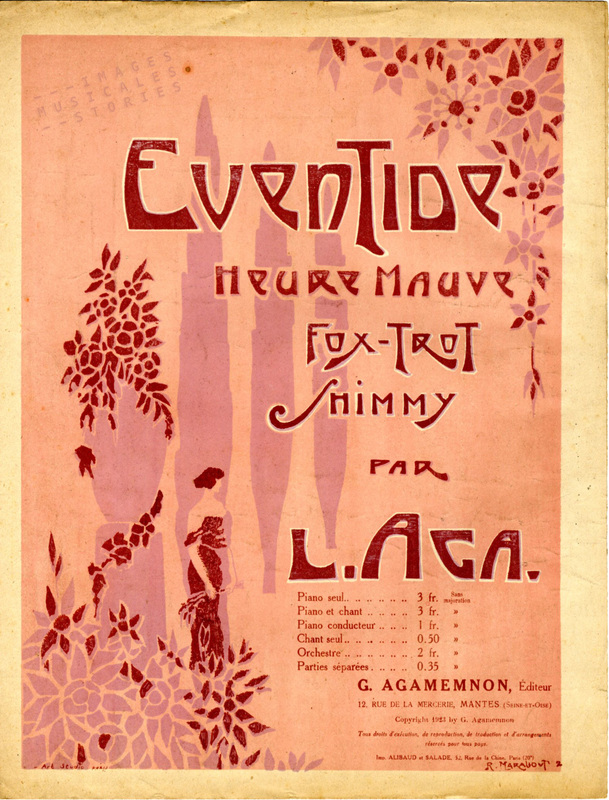 ‘Eventide – l’Heure Mauve’, fox-trot shimmy by L. Aga, illustrated by R. Marabout (Mantes-la-Jolie, 1923). Eventide is a literary word that refers to that sometimes magical moment at the end of the day, between daylight and darkness. The time before dusk, the twilight with its diffused, dim and bluish atmosphere. It is known as ‘the blue hour’, in French l’heure bleue or l’heure mauve, in German die blaue Stunde. The hesitating moment of transition seems to be ideally suited for nostalgia. For the music cover above, the illustrator dithered between hazy violet, pink and fuchsia to best express the sentimental longing of the lonely woman on a garden path lined with cypresses. Even the skilful art-nouveau typography and floral patterns ooze with dreamy languor. This cover reminds us of India Song, the 1975 film of Marguerite Duras, starring Delphine Seyrig, Michael Lonsdale and Mathieu Carrière. It tells the story of a failed love affair in a colonial setting. Plenty of regret, melancholy, desolation, sense of displacement, Sehnsucht and homesickness in this long slow film. It is the perfect opportunity to have a 2-minute look at the most impressive (some do not agree) ‘non-kiss scene’ in cinema history. Anyway, nostalgia also can have a slightly comical twist. 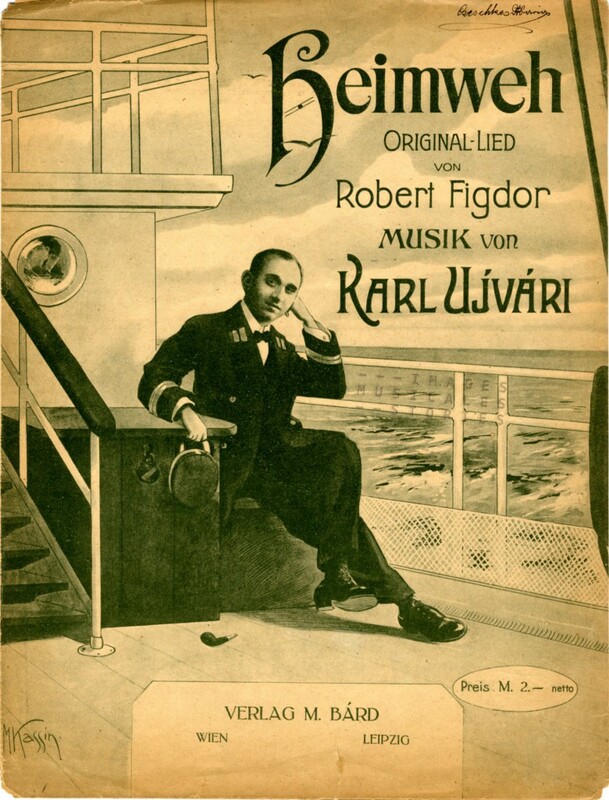 As in this disconcerting portrait of a ship’s commander. ‘Heimweh’ by Karl Ujvari and Robert Figdor, s.d. (M. Bàrd, Wien). Weer een mooie aanwinst, opgeslagen en bedankt FRank !